mini-dome, P-T-Z, vandal-proof, and mega-pixel camera models. To bridge the gap between analog and digital worlds, Panasonic also offers hybrid cameras that can be connected to conventional coax networks or Ethernet IP networks. The cameras include built-in coax connections, as well as a 10Base-T/100Base-TX Ethernet connection. 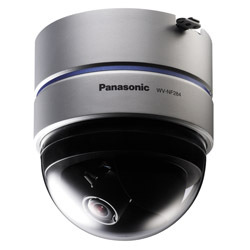 All Panasonic IP cameras allow you to monitor and control the units via an IP-protocol network from a networked PC. The cameras can operate on multiple protocols, including TCP/IP, HTTP, FTP, SMTP, DHCP, and others, depending on model. This flexibility allows you to utilize existing LANs, WANs, or Virtual Private Networks - and even the public Internet - to monitor remote locations without installing standalone video networks. The Panasonic WV-NF284 is the latest addition to the Panasonic i-Pro Series lineup. A compact, stylish network color dome camera with MPEG-4 & JPEG dual streaming. Control4 is now rolling out additional Internet services that extend the functionality of a Control4 system and enable anytime, anywhere access to a home. These services are distributed as an affordable bundled subscription through Control4 dealers.